Have you seen the trailer for The Age of Adaline yet? I've seen it quite a few times and every time I get more and more intrigued. So-to catch us up or refresh your memory-let's start by watching the aforementioned trailer, shall we? Adaline Bowman (played by the timeless beauty, Blake Lively) was born at 12:01 AM on January 1, 1908 (hmm...coincidence that she was born the first minute of the new year?). She got married and she had a daughter. Then, at the age of 29, a magical event occurred that would change everything for her: Adaline stopped aging. 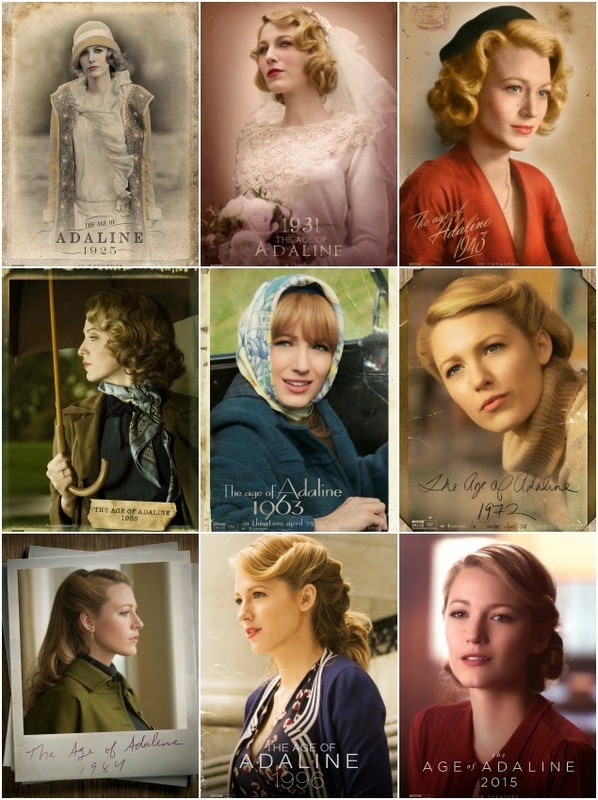 So, through the film, we watch Adaline move unchanged through every decade. And, out of necessity, she has no choice but to live on the run--keeping her secret. And because of this she's never able to just settle down and find love and peace-it seems that the only relationship she's able to somewhat keep is with her daughter. There's a poignant quote in the trailer where she says love isn't "...the same when there's no growing old together. Without that love is just heartbreak." To this hopeless romantic, that is a very very sad statement. But one that makes you think, what would happen to a love when one of you grows old and the other never changes? The hardest part, I think, is the knowledge that one of you will die and the other will be left behind. Which is always the hardest for the person left all alone, having to watch everyone they love die. That's pretty much my worst nightmare. But, as we see in the trailer, Adaline seems to have some hope of love. And-I feel like it's the younger guy. But...I sort of also feel like maybe it's her old friend, Harrison Ford. Either way...I'm super intrigued. And have already told Michael (multiple times) how much I want to see the movie. And the love story isn't the only reason why! I am a HUGE history nerd. True story. And I love the different fashions of the eras, so it is so cool to watch Adaline transform from the 1920's through present day, and to see the way her look has had to evolve and adapt. And how absolutely beautiful she is no matter what the decade. (And-as an actor-I'm super jealous because this looks like SUCH an amazing role to have the opportunity to play! Blake Lively was the perfect choice.) The Age of Adaline Tumblr has a beautiful look through the years with facts from each decade-so we can sort of get the idea of what the world went through, and all that Adaline has lived through and seen in her 100+ years. Whether it's for the magical intrigue of how Adaline suddenly stopped aging, or the love story, or just to see the fashion and beauty and history through the years in one film...there's pretty much a million reasons I want to go see The Age of Adaline. And I will! I might drag Michael with me or I might try to get my mom to go with me or I might just treat myself one day and go solo! Sometimes it's relaxing to enjoy a film with no other distractions, just you and the experience. Whether I take a loved one or go by myself-I know that I will enjoy diving into Adaline's world. The Age of Adaline releases nationwide on April 23rd at 7pm!